Citation Information: J Clin Invest. 2007;117(12):3868-3878. https://doi.org/10.1172/JCI33559. α-mOX40L mAb blocks TSLP-induced inflammation in lung. (A) Experimental design for TSLP-induced lung inflammation. BALB/c mice (n = 8/group) were administered 500 ng TSLP (or control PBS) intranasally on days 0, 1, and 2. 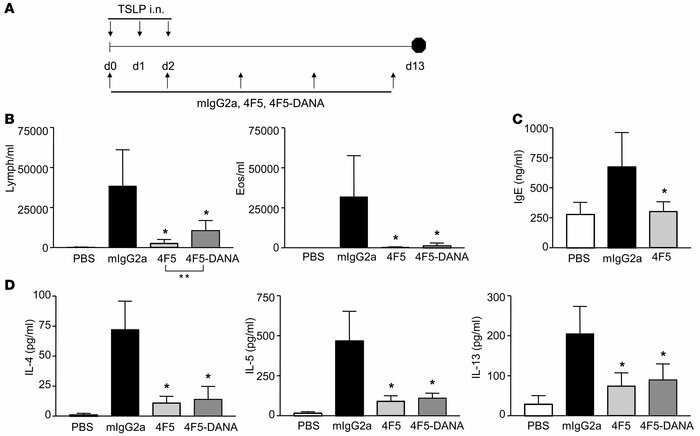 Mice were treated with 150 μg control mIgG2a, wild-type α-OX40L 4F5, or 4F5-DANA mAbs intraperitoneally on days 0, 2, 5, 8, and 12 and sacrificed on day 13. Numbers of BALF lymphocytes and eosinophils on day 13 (B) and total IgE levels in serum on day 13 (C) are quantified. (D) Levels of IL-4, IL-5, and IL-13 in the BALF were measured by ELISA. Results are the mean number of cells ± SD. *P < 0.01 (Dunnett’s test). One representative of 3 experiments is shown.